April 2, 1964 – Apollo Savings and Loan and the William Wrigley Jr. Company sign an agreement to build a $250,000 plaza between the Wrigley Building and 430 North Michigan Avenue, a building Apollo owns. Construction is scheduled to start by the middle of the month. The plaza will be called the Plaza of the Americas and will feature a flagpole for each member nation in the Organization of American States as well as Illinois and Chicago flags. 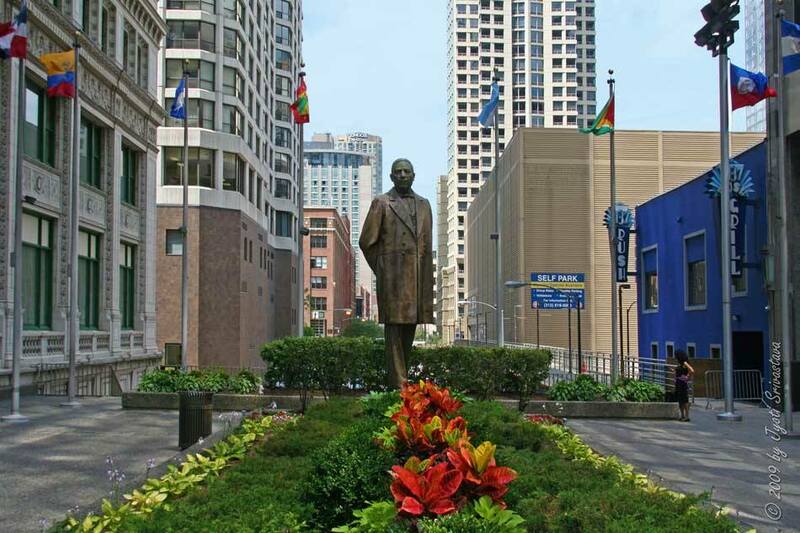 The plaza today features a sculpture of Benita Juarez, Mexico’s first president of indigenous descent, a leader who served five terms beginning in 1862. The work was executed by sculptor Julian Martinez. April 2, 1943 – The Chicago Daily Tribune reports that a contract has been signed that will lead to the demolition of 14 buildings on the 13-acre site of the Veterans Administration hospital, and the cleared land will become part of the west side medical center. Plans are to proceed with the construction of a 500-bed facility although an increase in government funding could double the size of the hospital. The demolition plans include all of the houses on the site that will have been vacated up to May 15. After that the razing of the more than 200 buildings still remaining on the site will be covered under the contract for the construction of the hospital itself. In 1941, two years before he was elected as an alderman of the Twenty-Fifth Ward, Illinois State Representative Vito Marzullo of Chicago convinced the governor and the legislature to pass the Medical District Act of 1941. The first piece of property for the district was purchased that same year. 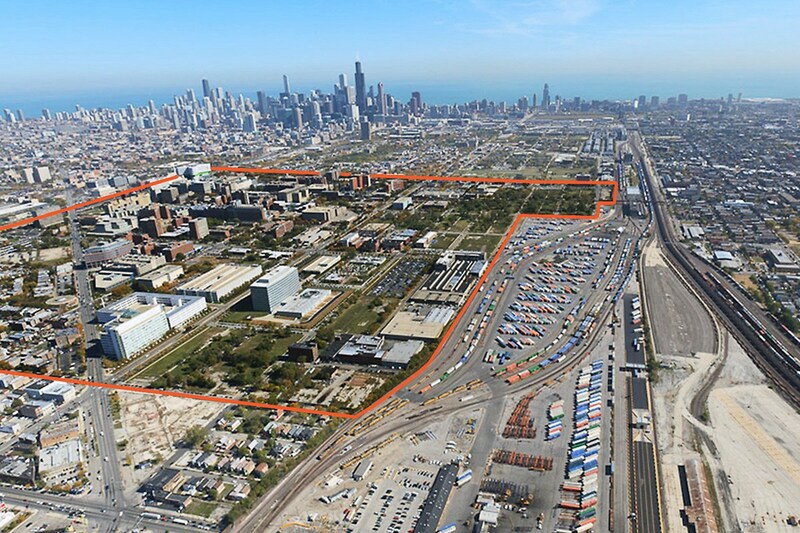 Today the district consists of 560 acres, supports four world-class medical facilities, and the whole thing is located less than two miles from the center of the city. The red perimeter marking the boundaries of the district in the above photo gives an idea of what began with the demolition of those first 14 buildings back in 1943. April 2, 1900 -- Mr. L. V. Rice, the receiver in charge of the Ferris wheel that made its debut at the 1893 World's Columbian Exposition, asks the Circuit Court for permission to begin taking down the wheel so that its 2,200 tons of iron and steel may be sold for scrap. 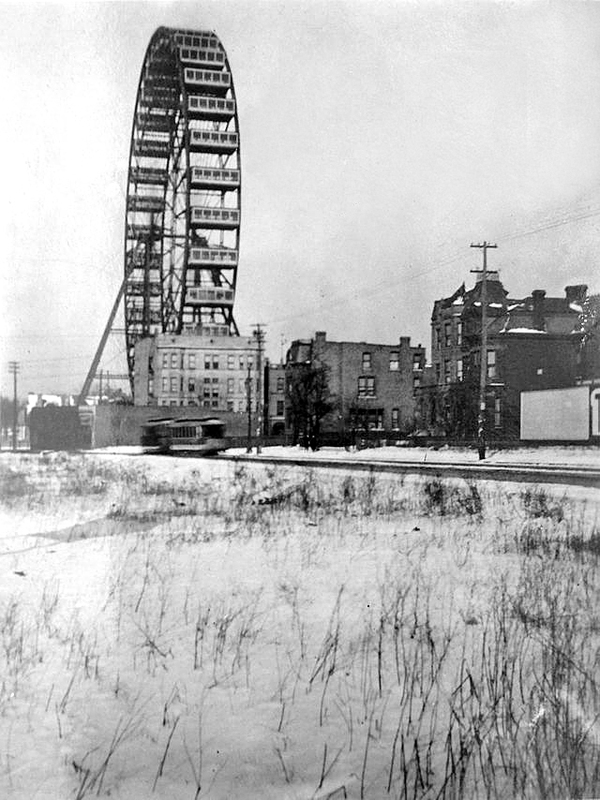 After the fair concluded in October, 1893 the wheel was moved north to Wrightwood and North Clark. Although 1,750,000 people rode the attraction in the six months of the 1893 fair; fewer than 500,000 climbed aboard in the ensuing five years. The Ferris wheel did, however, have one last life. It was moved to St. Louis as part of the World's Fair in that city, but only survived two more years before it was blown up in 1896. 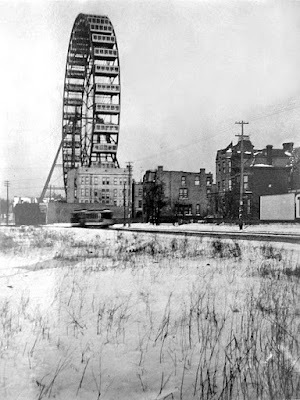 The photo above shows the great wheel somewhere close to where Dunlay's on Clark and Floyd's 99 Barbershop stand today.